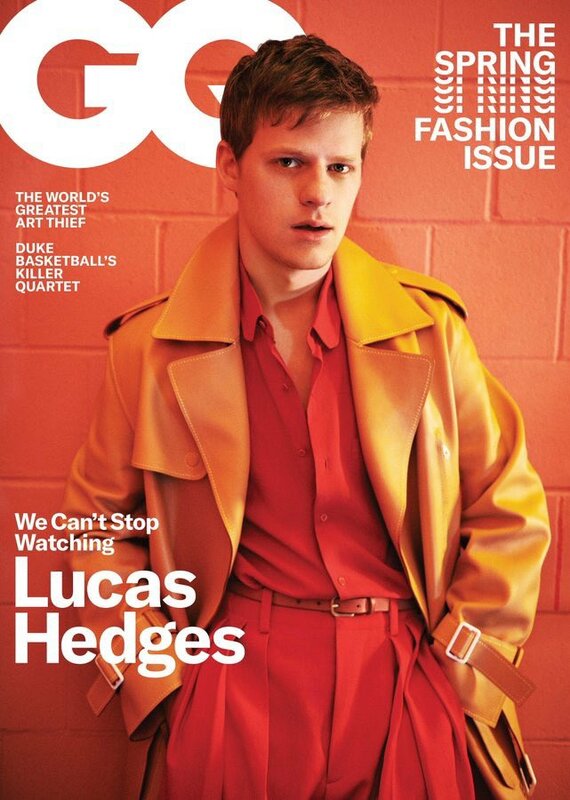 Lucas Hedges is on the cover of GQ’s spring fashion issue. The interview is nice, and Hedges comes off well, if a bit in-his-head, the way young artists can be. The photo spread is fun, with looks ranging from “1980s triple-divorcee” to “thrift store grandpa”. I appreciate the younger generation having more fun with fashion and blurring gender lines and playing with color and pattern in a way their elders mostly didn’t. Ten years ago photo spreads were all leather pants, cars, and whatever Chris Evans was doing that time. Now, young actors look like they might actually be having fun, and not trying to prove their masculinity by pouting as aggressively as possible at the camera. The interview goes into Hedges’ work of the last couple years, his Oscar nomination for Manchester by the Sea, his burgeoning career as a sensitive artist trying to get at the truth and whatnot. The most likeable Hedges gets is when he acknowledges how, er, interior it sounds when actors talk about acting: “You know, that's where it sort of becomes very esoteric. To some extent, it's just like, uh, ‘Just act, just f-cking act.” Hedges seems very aware of himself and what is happening outside of himself, with fame, like he has his head screwed on straight. Like he might actually have the self-awareness and the just-right balance of confidence and humility to get through it without losing his mind like young actors sometimes do. Wish the kid well, he seems great. Did you catch the part about the high school students being ASSIGNED to see him in a middle-school play? It comes in about two-thirds through the interview, as an anecdote courtesy his father, filmmaker Peter Hedges. Lucas was in a middle-school production of Nicholas Nickleby. Peter drops the gem that high-school students were assigned to see not the play itself, but Lucas’s performance in the play. I have a million questions. Were they from a drama class? Were they assigned to go see Lucas because his father is a known filmmaker? Or was it because Lucas was earning raves and their drama teacher told them to go watch the wunderkind in the lower school? Was it a real assignment, or like, extra credit? What were they supposed to do after, write a report? What was the purpose of this assignment, to demonstrate something about acting or make the high school drama department feel bad that they weren’t as good as the kid in middle school? Was this some kind of punishment assignment? Did the teacher have an inkling that Lucas would be famous one day and assigned the viewing as a kind of “see him when” thing? Why did this happen? What was the goal? WHY DIDN’T ANYONE ASK ANY FOLLOW UP QUESTIONS? I want a 10,000-word oral history on the high-school kids assigned to go see a specific middle-schooler in a Dickens play. I would like Peter Hedges to recount every detail he can remember about the high-school students assigned to see his son in a play. I want to know if Lucas Hedges is aware of this high-school students assigned to watch him. I really, really want to know what the purpose of the exercise was for the students. Lucas Hedges has always, since he came on the scene, seemed like a nice enough kid. This interview does not change that impression. It does, however, give us a whole mystery to solve with the high-school students assigned to watch one specific performance in a middle-school play. This is almost as good as “what IS Chris Evans doing in this photo spread”? Send me your theories about the high-school students, and if you are the teacher who doled out this assignment, I am now doing a ten-part podcast exposé called The Assignment, please agree to come on and thoroughly explain yourself.